AT&T customers in the US got the first crack at checking out the unorthodox looking Motorola BACKFLIP, but TELUS customers are now getting their chance at experiencing all of the features we've seen with the Android powered device. There's a slight modification that can be seen with TELUS's version of the BACKFLIP as the original silver bezel has been replaced with a slightly darker colored one. As for everything else, it remains intact with its 3.1” HVGA touchscreen, 5-megapixel camera with flash, Wi-Fi, Bluetooth, GPS, and 3.5mm headset jack. 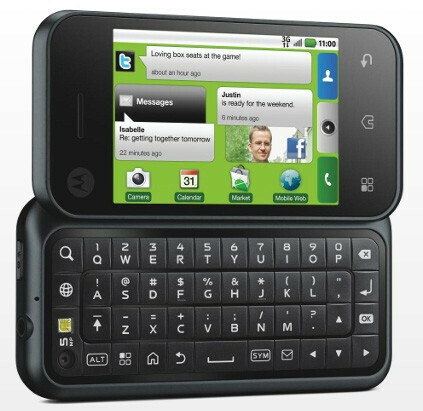 All of those features are packed into its unique backflip like motion that's required in getting the QWERTY keyboard into its usable position. Pricing on the other hand remains to be one of the biggest differentiators between the one AT&T customers are subjected to. Interested customers can grab it for $99 on a three year contract – which could make some consider getting it for the no-contract price of $399.99. It looks a little better now.